Who doesn’t love pancakes? Just as with chocolate chip cookies, finding the perfect pancake seems to be a personal odyssey for almost everyone on a specialty diet. It has not been easy to find a gluten-free (or preferably grain-free) pancake recipe that stands up against comparison to the real deal. Even when the flavor is spot-on, the texture often leaves something to be desired ending up too delicate to flip without tearing, burning in the blink of an eye, or dissolving into mush under the application of syrup. In the last month or so, I am pleased to say that we have discovered at least two grain-free pancake recipes that pass muster at our house. The first, which I unfortunately have not photographed yet, is a caramelized plantain pancake from PaleOMG thickened up with coconut flour. Plantains are a great alternate starch for primal baking because they provide a bread-like texture that works nicely for both savory and sweet applications. Next time I buy plantains, I’m planning to dehydrate some of them and try grinding them into flour for storage, but the nice thing about plantains is that you can bake with them right out of the peel, and they are useful either green, ripe (fully black) or black-spotted yellow in between. The biggest problem with plantains is that the grocery stores do not carry them reliably, and we have been going through them fast between flatbreads, biscuits, chips, and banana bread. So I had to find an alternative this weekend when Jeremy requested pancakes this weekend and we were fresh out of plantains. I decided to try out cashews as a base, and boy am I glad I did! 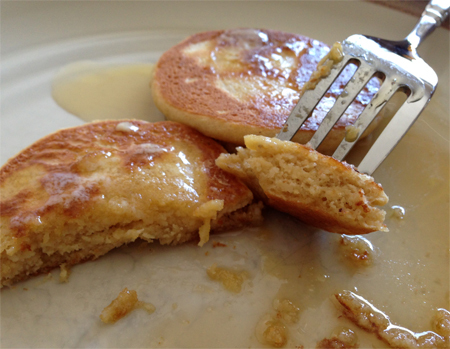 These pancakes tasted great, looked like real pancakes, held up perfectly on the griddle, and had a moist, fluffy texture that didn’t dissolve under syrup and butter. They were also easy to make by throwing all the ingredients in the food processor, which is always a bonus. Jeremy gave both of these pancake recipes his seal of approval, and commented that the cashew ones would be yummy topped with fruit–I heartily concur. Nolan wouldn’t touch them in their standard format, but more on that below. Place the cashews, arrowroot, sweet potato flour, baking soda, cinnamon and salt in the food processor and grind into a fine flour. Add the eggs, milk, stevia and vanilla, and process again until very smooth. Add a bit of extra milk if the batter seems too thick. 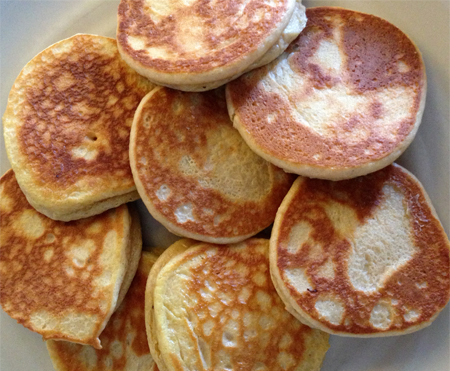 Fry up into pancakes on a hot griddle with coconut oil or ghee; I used a 2-T scoop for portioning, but I think these might hold up as larger pancakes also. Source: Freely adapted from Everyday Maven. I like to save a small amount of pancake batter from every batch to make into muffins or mini-muffins for Nolan, since he is more likely to eat them in that format. With these cashew muffins, I saved about half a cup of batter for this purpose and added 1 T cocoa powder and 1 T maple syrup, plus a couple of chocolate chips on top of each muffin. 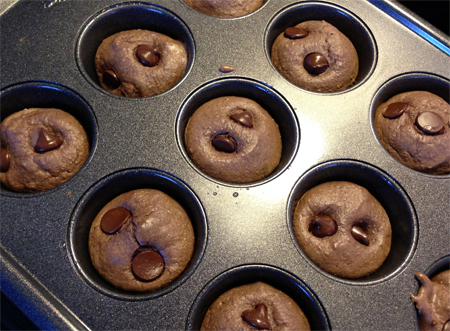 I baked at 400F for 8 minutes, and ended up with tasty little double chocolate muffins that sink down into something like soft chocolate cookies as they cook. In this incarnation, Nolan was much more willing to eat them, and honestly, we all gobbled them up because they were pretty addictive! At some point soon, I will have to adapt a full batch recipe. As a cashew lover, I just know I would adore these pancakes! They look amazing!